It’s time for what has become an annual review of what did well in the garden this year. I like to do a recap of some of the best performers every year, plus point out a few of the less than stellar ones. It also gives me a chance to analyze my own performance, and where I could stand to improve. After over 35 years of gardening, I still have lots to learn, and every year the garden reminds me of that! In past annual reviews, I called 2012 the Year of the Carrot. And 2013 was the Year of the Squash, when I hauled in 370 pounds of them. That was truly way too much of them to eat, so the 259 pounds I harvested in 2014 is a bit more manageable amount. Carrots also did well this year, and for the first time I grew two purple ones, Purple Haze and Purple Dragon. I love the way they color up salads, slaws and other raw dishes. I also grew one called Cordoba this year, and while it was very productive, the carrots have very little flavor. I won’t be growing it again. I guess I could call 2014 the Year of the Bean. We had ample supplies of snap beans throughout the summer months. And I finally seemed to have settled on some reliable and tasty varieties. Fortex is a favorite for many gardeners, me included. These pole beans stay tender and stringless even when approaching a foot long. But as much as I like Fortex, the green, flat podded Musica is another great performer here as well. It has come to be my favorite Italian style snap bean. It was my first year growing the yellow podded Gold Marie, but it won’t be my last. It was another standout in the garden this year. Together they make a lovely and tasty combination, and I froze many of them together like that. The dry beans also did well this year, though the bush beans certainly seem to outperform the pole varieties. This year I grew the bush varieties Jacob’s Cattle, Whipple and Hutterite Soup Bean. All three did quite well, though dry beans will never be the greatest yielding crop for the amount of growing space they require. Still, it’s fun to grow them, and if I had a bigger garden I would grow even more of them. 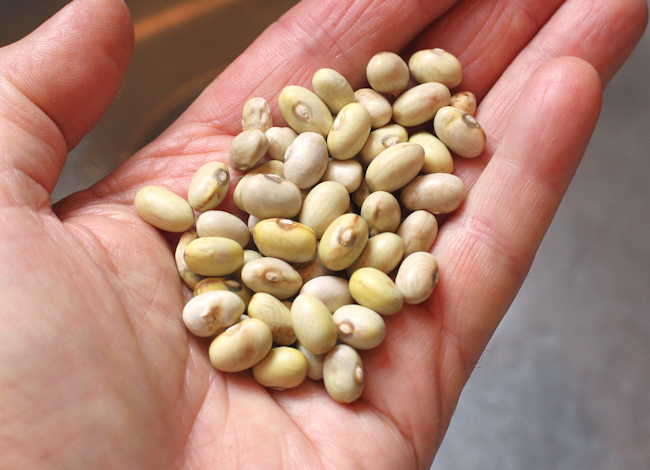 I also grew the pole varieties Cherokee Trail of Tears, Good Mother Stallard and the dual-purpose Rattlesnake which is tasty as both a snap bean and a shell bean. 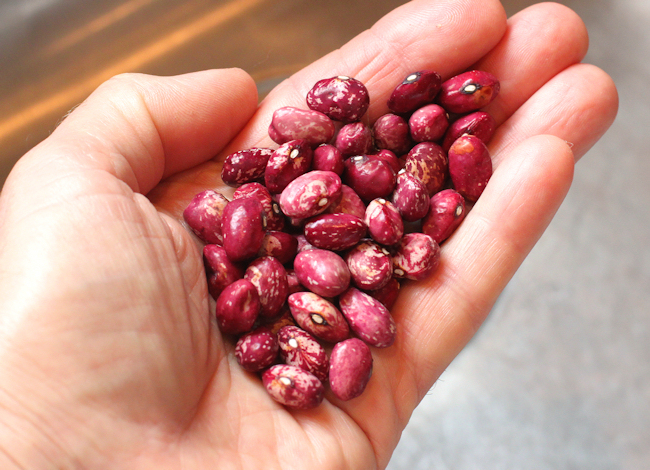 I wound up with 5.5 pounds of shelled dry beans this year, which I know I will enjoy eating in the months to come. My wife might argue it was the Year of the Blueberry, since she is the Queen of Blueberries around here. She managed to top last year’s total of 51 pounds by bringing in 54 pounds of the little blue jewels. We enjoy eating them most every day. I had tried to grow them at my old place, but was never able to get them established. There were three bushes at HA when we bought the place back in 2007, and we planted six more to go with them, plus replaced one of the originals with a more productive and flavorful variety. Chandler makes big blueberries, but Elizabeth, Nelson and Elliot all do well here and are very tasty too. 2014 was a good year for peppers here too. The bell peppers did exceptionally well, no doubt liking our wetter and cooler than usual summer weather. When I say ‘cooler’, that’s relative to our usual scorching hot summers. Big Bertha, Red Knight, Early Sunsation, Flavorburst and Orange Blaze all did well last year, and gave us lots of big sweet peppers for eating fresh, roasting, drying and freezing. It was my first year growing two Italian heirloom peppers, the sweet Topepo Rosso and the hot Piccante Calabrese. Both did quite well, and I plan on growing them again. Both were great for pickling, and I still have a few left in a jar in the frig. In the above photo they are hanging out with another of my favorite heirloom Italian peppers, Jimmy Nardello. Tolli’s Sweet Italian pepper is another o/p one that did great here. Next year I want to try Corno di Toro Rosso again and see how it does. While the peppers might have done well, overall it was just a so-so year for tomatoes. We had plenty to eat, process and freeze, but the overall yield was just average. Vinson Watts again proved to be the best heirloom type for slicing and fresh eating. Cherokee Purple again disappointed, and I have gotten new seed to use instead of the ones I have been saving to see if that will help for next year. I also plan on trying the Mortgage Lifter strain that the Halladay family has been improving for three generations now. The paste tomatoes did great though, and we had plenty of them for processing into sauces and making into ketchup. My old standby determinate varieties Viva Italia, Health Kick and Rio Grande did great. One newcomer also did well, an indeterminate o/p variety called Quadro. I’ll be planting it again for sure. It was a great year for kohlrabi here. The Kossak variety gets large, and most I harvested weighed in between one and two pounds. That adds up to a lot of kohlrabi very quickly! They also keep well in the refrigerator or other cold storage. We just used up the last of the fall harvest right before Christmas, and it was still crisp and tasty. I also grew the purple Kolibri and the light green Winner. We eat a lot of the kohlrabi raw, but it’s also tasty when roasted in the oven. The last couple of years I have make kohlrabi kraut, and it is a flavorful companion to the fermented sauerkraut I make with cabbage. Once I learned how easy it is to make small-batch sauerkraut in glass jars, we almost always have some of it on hand in the refrigerator. Garlic is another of my favorite vegetables, and another thing that we try and always have on hand. By growing varieties that are ready early, like the Asiatic/Turban types, and ones that keep well like the Silverskins, I pretty much never have to buy garlic anymore. It was a good year for garlic last year, and the artichoke types I grow like Siciliano, Simonetti and Lorz Italian all did quite well. I love these for baking whole, and when they are done the garlic has a rich but mild flavor. Garlic goes in a lot of things around here, from a topping for pizza, to a dip for kohlrabi, and some even went in a jar with the pickled peppers. I also dehydrate it to make garlic powder. I love garlic, and growing it yourself lets you choose from so many different wonderful varieties. While I’m on root crops, I grew quite a few blue fleshed potatoes here this year. I tried Adirondack Blue, Magic Molly and Purple Majestic for the first time. Adirondack Blue was the most productive, and I will likely grow it again next year. I also grew Red Thumb, French Fingerling and Yukon Gold potatoes. Though many have started to sprout, we are still enjoying the potatoes I harvested back in July. 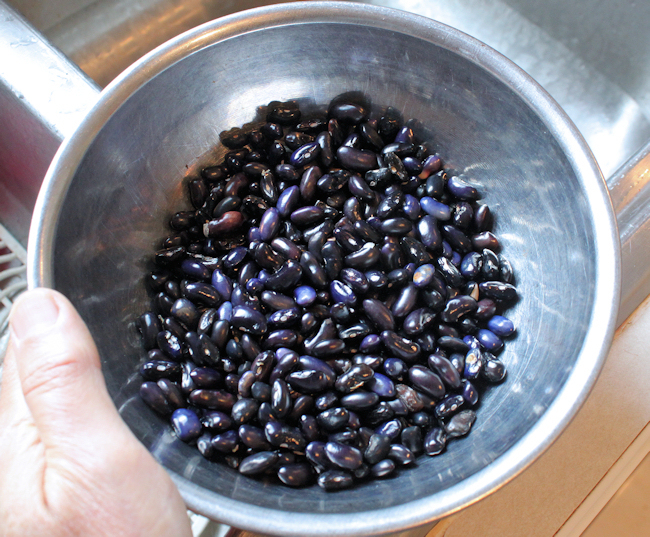 More than just a novelty, the blue potatoes are loaded with anthocyanin pigments which give them their color. They make blueberries blue, and purple skinned eggplants purple, and I’m always happy to add more to my diet. Another vegetable that’s loaded with anthocyanins is the purple fleshed sweet potato. This year I grew the variety Purple that Norma (Garden to Wok) shared with me this year, plus Carla’s Purple that our friend Carla shared last year. The Purple variety wound up being the most productive here this year, and I look forward to growing it again next year. As I mentioned earlier, it was a good year for winter squash. I did a taste testing back in October of a few of the varieties. One of the ‘new’ varieties I tried this year is a Thai variety called Rai Kaw Tok, and it was truly a standout performer. 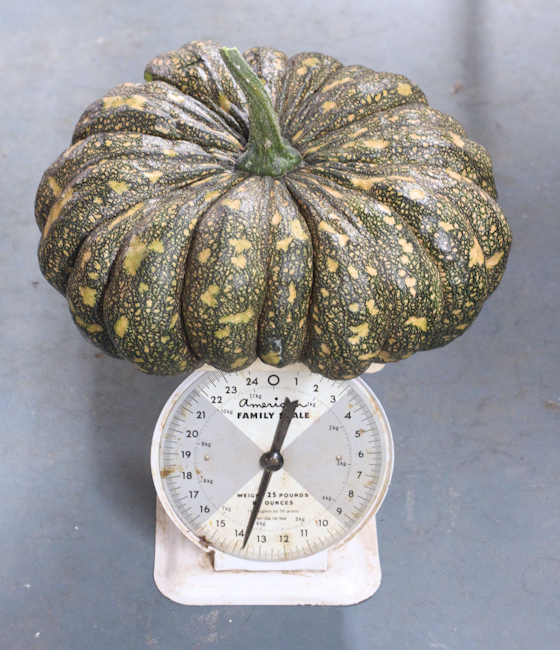 It’s a C. moschata type with a great flavor, and one vine produced 65 pounds of winter squash, including one that weighed in over 13 pounds. The summer squashes all did well too, and once again the o/p zucchini Striata d’Italia was the last plant hanging on at the end of the season. I harvested the last one on October 14th. Another favorite summer squash here is the heirloom White Scallop. My wife and I both enjoy the unique taste of this one, and you can see it hanging out with the Striata d’Italia in the above photo. Fresh greens are always a welcome treat here. The first harvest of 2014 was spinach, and it’s possible that the last one of 2014 will be too. I’m always looking to grow more of this tasty vegetable. These days one can buy spinach pretty much every day of the year, but I have to say none of it I buy ever has the taste of homegrown spinach. This year I grew mostly o/p heirloom varieties, including Giant Winter (aka Gigante Inverno), Monstrueux de Viroflay, and Amsterdam Prickly Seeded. All three have a flavor that easily beats any I’ve ever bought in a clamshell at the grocery. Kale is another of my favorite greens. I tried one this year called Coalition Mix from Adaptive Seeds, and it made some large, tasty leaves. Like spinach, I think homegrown kale has more flavor that anything I buy at the grocery. Some of the hybrid kales like Winterbor might be a tad more hardy here, but I don’t think they have quite the flavor of many of the o/p varieties I’ve grown. Maybe I need to do a kale smackdown next year and do some serious taste-testing! I hope you have enjoyed this review of some of the veggies and fruit that performed well here in 2014. I hope 2015 is a great year for all of you out there. I’ll be back soon with more adventures from HA. This entry was posted in Gardening and tagged beans, blueberries, dry beans, fingerling potatoes, garlic, kale, peppers, pole beans, potatoes, sauerkraut, spinach, sweet potatoes, tomatoes. Bookmark the permalink. It looks like you had a great year. And I so envy your blueberries. For some odd reason they don’t seem to like it here. And in our area they grow wild in the woods. You would think I could get them to grow in my garden, but so far they haven’t done well. Looks like you had a great garden! I didn’t have a garden this year because of health problems, but hope to get back to it in 2015. The Fortex beans look interesting. If I can find seeds I may try them. The only pole beans I’ve grown are the Kentucky Wonders. All of your veg look wonderful – you grew so many different varieties of each….I just love all the diversity. I’ve noted down several to try next year, including the kohlrabi – I can’t get over how large yours grew as mine were not even 2″ across. 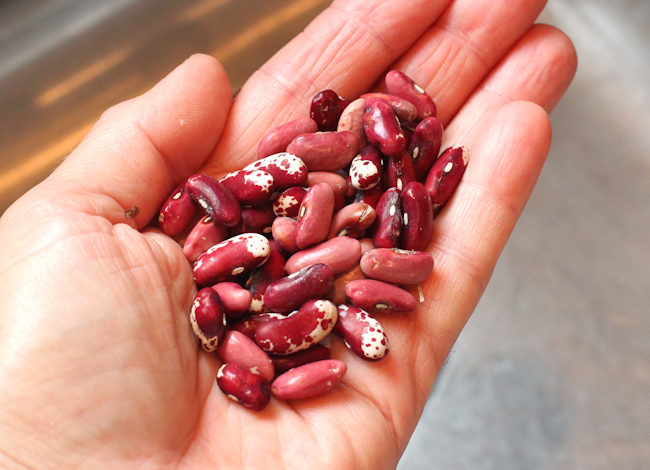 And wonderful idea, freezing different varieties of beans together for an instant bean medley – I hadn’t thought to do that. Terrific Site Dave! I’ve only been following a few months, but I am learning so much. You’re a great source of information and inspiration. Thanks Mike! I’m glad you enjoy it. Thanks for the info! I’m making my seed order today and will include these varieties.